It should come as no surprise that Keith Rankin's synthesizer escapades as Giant Claw spiral and dance into the sky and beyond. Hailing from Dayton, Ohio, otherwise known as the birthplace of aviation, Rankin's work evokes imaginary soundtracks to vintage black-and-white space travel flicks twisted in a funhouse mirror and blasted through a wind tunnel. Seemingly empty constructions of beeping background tones and the rhythm of idle flight machinery escalate into a frantic, rapid paced voyage on their way to the closing title track: a climactic opus of planetesimal proportions that rises, falls and nearly crash lands several times over its nearly 18-minute span. 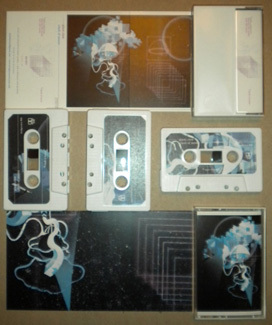 Edition of 100 pro-duplicated chrome cassettes with full-color labels and doublesided printing on heavyweight gloss stock.